That experience two winters ago illustrates the challenges Russia faces as it attempts to exploit the Arctic’s resources—a subject Xelot documents in his poetic series There Is Gas Under the Tundra. 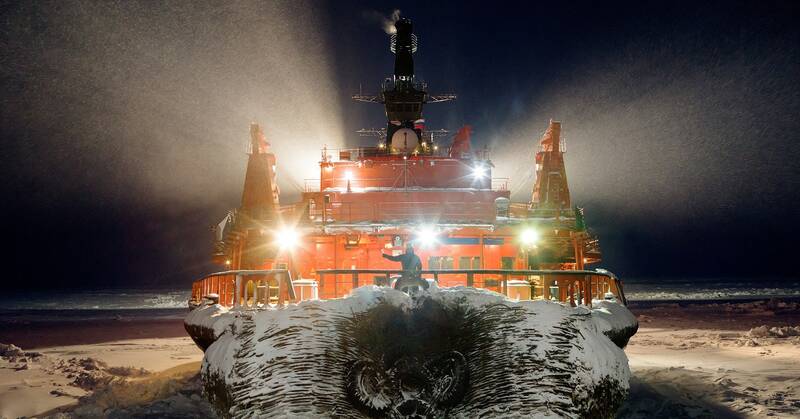 His surreal, industrial photographs depict the construction of the new plant, its freezing environment and shipping activities along the Northeast Passage—including the monstrous icebreaker (pictured above) that appeared one snowy night to tow the ship to port. “We were like, ‘Yes, finally! We’re going to move! '” Xelot says. The Arctic contains an estimated 22 percent of Earth’s undiscovered oil and natural gas, with more than 60 big fields—43 in Russia—discovered since the early 1960s. Until recently, those resources were mostly trapped beneath ice and the high cost of working in an undeveloped region. But that’s changing as melting ice makes it easier to drill and opens up new shipping routes like the Northeast Passage, which cuts travel time from Europe to Asia in half (and avoids pirates to boot). Of course, obstacles remain: Ice eight months a year, darkness for three, and extreme weather with temperatures below -50 degrees Fahrenheit—to say nothing of the fragile environment. But Russia, whose economy partly runs on energy exports, is eager to dominate the new frontier. Xelot heard about the project four years ago while living and working in Russia. It combined his love for extreme climates with his background in environmental engineering, a career path he ditched for photography in 2010. So he contacted Novatek, and they agreed to let him document the plant in exchange for some photos. He did so with a digital medium format camera during six trips to Yamal, traversing the icy terrain by snowmobile, trekol (a six-wheeled, amphibious hulk that Putin favors), and ship—and not just the one that got stranded. Xelot also sailed the Northeast Passage aboard the Christophe de Margerie, a new $320 million icebreaker-tanker that can cut its own path through ice nearly seven feet thick. It’s one of 15 such vessels expressly designed for Yamal LNG—demonstrating Russia’s resolve to overcome the Arctic’s challenges and export its energy to the rest of the world.